Can you imagine the smell of over two million plants in one place? You won’t have to if you visit northern Thailand’s The Royal Flora show this winter. The Royal Flora Ratchaphruek was a flower festival held 1 November 2006, to 31 January 2007, in the Thai city of Chiang Mai that drew 3,781,624 visitors. It was one of the grand celebrations being hosted by the Royal Thai Government in honor of King Bhumibol, the world longest reigning monarch. The place gathers the South East Asia most numbers of tropical plants and flowers which are 2,200 plants on 2,500,000 trees. There is Ho Kham Royal Pavillion featuring Lanna architecture. The entrance of the pavilion is decorated by 30 glorifying gates with the images of duties and thoughts of the H.M. King. 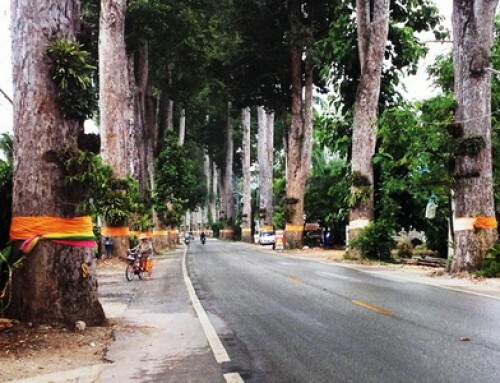 The gates are paralleled with Ratchaphruek trees. Exhibition hall, international garden and the King Glorifying Garden are also available. The garden is now opened for public and more activities are also held. The event was located in 80 hectares of land at the Royal Agricultural Research Center in Mae Hia sub-district, Mueang district, Chiang Mai Province in northern Thailand. The 92 days of the expo featured 30 international gardens reflecting nations such as Japan, South Korea, Belgium, Netherlands, South Africa, and Canada; more than 2.5 million trees of 2,200 species of tropical plants and flowers are presented to the world in this exhibition. The AIPH, the Association of International Horticultural Producers, gave this expo A1 status, its highest level; such an exhibition occurs only once a year throughout the world. In addition, a host country can only hold one such exhibition once a decade. Gardens for the king There were two features in this zone: one was International gardens, which were presented by 30 participating nations and covered 21,000 square meters; the other was Corporate gardens, which covered 27,475 square meters, and were presented by both Thai state enterprises, and domestic and international major corporations. Ho Kham Royal Pavilion This pavilion is the symbol of the garden. It features traditional architecture in the style of Lanna, Northern Thailand. The Pavilion has high ceilings and steep multi-tiered roofs, exquisitely guided in ancient technique. Visitors will be amazed by the uplifting beautiful of Lanna wisdom and craftsmanship. The insides showcase Paintings of King Bhumibol many activities aimed at the improvement of life for all Thai people. These works are an innovative juxtaposition of modern and traditional styles. The artists employ subdued tones of grey, red and gold, imbuing their work with a Strange. Dreamy quality. These Paintings feature backgrounds drawn from the stylized tradition of temple mural Paintings. with crisp – almost photographic “forms superimposed over them, imbuing the paintings with a surreal, otherworldly quality. The Pavilion also houses the gorgeous Tree of the Ten Kingly Virtues. It is comprised of layered orbs of gold Bhodi leaves, and symbolizes the fact that the King provides a garden of spiritual Shade for his people. Thai Tropical Garden The enormous 100,000-square-meter garden showcased the diversity of tropical horticulture: fruit varieties, plants, flowers, herbs, and rare plants. Corporate Gardens – Presented by various organizations and State enterprises, the Corporate Gardens showcase sustainability and eco-friendly agricultural techniques. The philosophy of these Gardens is driven by His Majesty tremendous insight and ingenuity to improve his people well-being. The idea is to spread knowledge and provide a model which Can inspire those who visit the Gardens to internalize His Majesty- theories and to go on to Iearn and Care for the world. International Gardens – This is an area where visitors Can enjoy unique and innovative landscaping as well as horticultural highlights from 33 countries around the world, such as Japan, India. Bhutan, and South Africa. Not only does the International Garden include plants but each country- beautifully showcases its Particular identity through architecture and art. Indoor Exhibition – The indoor exhibit consists of hydroponics, a tissue culture nursery, as well as a dome for tropical plants and buildings for desert and temperate plants. Outdoor Exhibition – The Outdoor Gardens includes water plants, a lotus garden, plants from each province in Thailand, plants which are believed to be auspicious, plants from Buddhist history, and plants painstakingly trained into incredibly beautiful shapes. There is also a building which exhibits information on the history of Thai horticulture. The enormous Outdoor Garden showcases the diversity of tropical horticulture. Rare Plants – Ratchaphruek Garden displays rare plants including the ‘Royal Palm’ and the Double Coconut’, which Stand at the garden entrance, and ancient pine trees which species dates from 250 million years ago. Royal Palm – The smooth gray trunk, which is swollen at the base when it is young and at the middle when it is mature, sculpts the palm into a bottle Shape. Its strikingly tall trunk can reach up to 20 meters in height, and its deep-green leaves make for an attractive tropical look. Double Coconut or Coco de Mer – A native of the Seychelle Islands in the Indian 0cean. this palm is mostly- grown for ornamental reasons – the fruits resembling a double coconut contain the largest seeds in the plant kingdom – they are up to a0cm in diameter, 45 cm in length and Can weigh up to 14 kg. เท years past, the nuts were believed to have aphrodisiac qualities, probably owing to their similarity- in appearance to the female pelvis region. In the 1700, the fruits were sold in Parts of Europe for a very high price. The tree was also once thought to be the Tree of Good and Evil in the biblical Garden of Eden. Expo Plaza This was the focus of the exposition’s fun-filled activities, amenities, and services. Visitors were able to purchase products from the Royal Projects and authentic local products from Chiangmai such as handicrafts, paper umbrellas, and souvenirs. Cultural shows A total of 45 cultural shows from various regions of Thailand were performed here, including traditional music and dance. In addition, cultural performances from other nations were presented in this place. The theme for the Fair is “Reducing global warming to save planet earth and to improve the quality of life,” focusing on the concept of 3Gs (Generation, Garden, Greenitude) and 3Rs (Reuse, Reduce, Recycle). The plan is to educate youth and encourage their love and understanding of nature. It also plans to teach them the importance and value of planting trees, and instilling in them a sense of responsibility towards sustaining a green and healthy environment. It also seeks to educate the young about global warming through reducing the exploitation of energy resources by reusing and recycling. Royal Flora Ratchaphruek opens daily from 8 am. until 6 pm. The park is best visited early morning or late afternoon to avoid the midday heat. Normal is 50 Baht for Thai Adults, 100 Baht for Adult Foreigners. The Royal Flora gardens are located near the Chiang Mai night safari in Mae Hia subdistrict, about 12 kilometers South West of downtown Chiang Mai. Getting to the Royal Flora Ratchaphruek from the city of Chiang Mai is relatively easy, with taxi, tuk tuk or Travel Agency in Chiang Mai being quite affordable. It would take 20-30 minutes each direction. If you travel to the garden by taxi, you will need to make sure you get the driver’s phone number in order to make arrangements for the return trip.